Big one for the team. 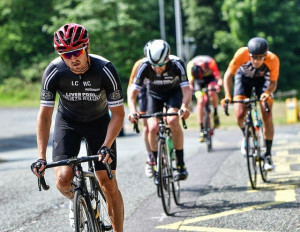 We had a strong Liverpool Century team of five entered in the Dave Hitchen 2-day Stage Race (E/1/2/3), a popular race organised in memory of the late St Helens CRC rider. 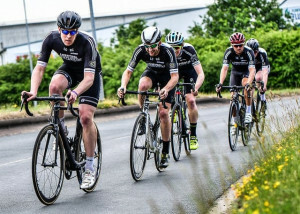 The team consisted of Declan Hudson, Dan Stevens, Dave Rydings, Marc Heuston, and Tom Stewart, and although the team was picked a little while back, we hadn’t had much of a chance to train together and plan for the race ahead. Luckily, all three stages were on local roads so we knew what to expect and how tough this race was going to be. We would be competing against 11 other teams, most of whom were well established sponsored teams, complete with a couple of ringers, and some big hitters coming in off the Ras. It’s a rare occasion that you look forward to a race and open the curtains to be met with sunshine, but today was one of those days. The Town Green circuit is a relatively flat and exposed course which the organisers have been working hard to have approved. We managed a quick photo before the start, and decided that Declan was to be our man to try and make the early move, followed by Tom then Dan. Dave and I felt that the course suited the types of rider Dan, Dec and Tom are, strong riders with big engines – not enough lumps for us smaller folk. As expected, it was super-fast from the start with Dec and Dan featuring in a couple of early moves, but unfortunately for us nothing was sticking. It was proving difficult to move to the front let alone attacking off the front with the first 15 miles covered at 29mph. I’m not sure exactly when the first move went, but when it did it featured 17 riders with most teams represented except for Liverpool Century. It was unfortunate as this left us in a terrible position, having to get organised to try and close the gap. We had all 5 riders on the front at one point pulling to reduce the deficit but the break seemed to be working well together adding to their gap each lap. I decided to sit back in the bunch before the other 4 decided to stop the chase when it went out to 3 minutes, keeping one eye on the TTT in the afternoon. A lull in depleted bunch meant that the break extended their gap and put the overall GC beyond anyone who hadn’t made that move. Within an hour of racing, it was to be decided between those 17 riders. Our group seemed happy to roll in to the finish but with a lap to go a couple of riders jumped off the front and started to build up a small gap, luckily for us Tom was one of those still alert enough and he set about taking 30 seconds on the rest of us in the bunch. 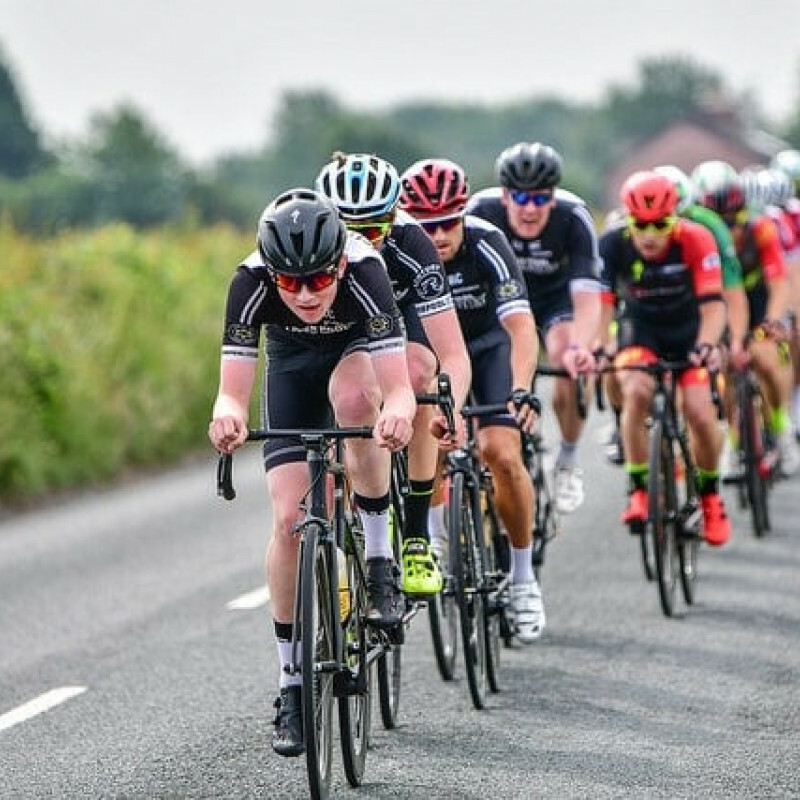 The stage was decided between those in the break, with a small group of 4 clipping off the front to contest the sprint – Aidan Quinn from Dooley’s Cycles taking the win. Tom finished just ahead of the bunch with Dec, Dan, Dave and myself all rolling in to fight another day. We had around 90 minutes between the end of the road race to our start time for the team time trial around the Pimbo circuit, a slight disadvantage of being the second team off. This TTT has been a mainstay of the stage race over the previous years and has on occasions helped decide the overall GC. Although out of contention for the overall, we were still keen to put in a good time and felt we had a strong enough group of riders to get a result. 4 miles meant anywhere between 8 and 10 minutes of effort. We knew that this type of effort would suit Declan and Dan, but as the time was based on the third rider across the line, we decided that it would be better to stay as a 5 for as long and take shorter turns to keep the speed up. It seems like a bit of a blur but as expected Dan and Declan roared across the line, closely followed by me sprinting like a lunatic to stop the clock at 9 minutes dead, for an average of 28.8mph. On reflection we felt that we lost a little bit of time on the downhill section, but were happy with our time which put us in to first place (out of 2!) at the time, but with 10 teams to follow. 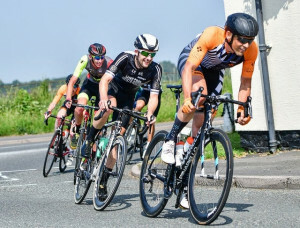 Another cracking day for a road race, this time it was the Cobbs Brow circuit which many of you will recognise from the Bickerstaffe chain gang route. It’s a 7-mile rolling course, complete with technical sections and loads of pot holes! Race HQ was at the Ring O’Bells pub, an excellent choice for many of those who already had their mind on a post-race pint. We just had the small matter of negotiating a tough 70 miles on one of the warmest days of the year! We had more of a plan today, send Dan up the road early in the hope that the main protagonists would let him get enough time to eventually be joined by the decisive break. Dan went, and I found myself chatting to Declan in the bunch and told him to move up to the front and follow the next move. Declan being Declan decided that the next move was to be his move, and set about making his way to Dan up the road. He was joined by a strong RAF rider and the three started to put time in to the bunch, only to be curtailed by the organisers calling for the race to be neutralised after a big crash. With Dan and Dec brought back to the bunch and the race stopped, race leaders Dooleys allowed them to drift off the front to re-establish the gap they had, a classy move. The break eventually went with Dan and Dec still up the road, 6 riders made it 9, but with Dan having spent a lot of energy establishing the gap with Declan, he drifted back to the bunch with his job done. 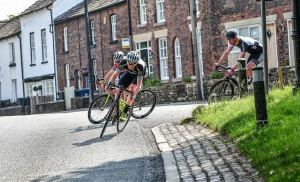 It was at this point with 4 laps to go that the pace was ramped up heading up ‘Murder Mile’ and the Century contingent found themselves unexpectedly at the back and scrambling to move up before the punchy Cobbs Brow climb. Dan went first, spent from his earlier efforts, closely followed by Tom then eventually Dave and myself. Tom cramped up and decided to call it a day, with Dan taking his foot off the gas to finish a lap down. Dave and I continued to work with a couple of lads from Secret Training to limit our losses to the 15 still left in the bunch. Declan did us proud with an outstanding ride, staying away all race in the break to claim a good result behind eventual stage winner Mike Ashurst of Onimpex Bioracer. A massive well done to Brian Rigby and his helpers for organising a great race, and to some of the winners who donated their prize money to the North West Air Ambulance charity. A fitting end to a fantastic weekend of racing.